Last week my husband and I had the amazing opportunity to travel to Quebec City for a summit put on by his company. For four days, I was just “Scott’s wife.” I wasn’t a mom. I wasn’t even Jessica, necessarily. Stripped of parental and personal responsibilities, I was there simply as his wife, and it was wonderful. I was also stripped of my connection to the rest of the world. Our cell phones don’t work internationally (because let’s face it – we don’t need that capability very often), so the only time I was able to connect with social media was in our hotel room when I deliberately connected to the hotel’s Wifi. No idly checking my newsfeed during a lull in dinner conversation. No casually scrolling through Instagram while waiting for a program to start. No instant updating of my status with a funny story or picture. All of that had to wait, and as a result, I was forced to be fully involved in every moment of our trip. Admittedly, it was hard. I felt a sense of panic at not being able to connect as easily with my mother-in-law as she watched our daughter, and was concerned that if something happened at home no one would be able to get in touch with us. Sadly, though, a lot of my anxiety was over my inability to stay up to date on what was happening with everyone at home. I’m with my family – at the park, or in the car, or lounging around the house. We’re having a good time when, without even realizing I’m doing it, I pull out my phone. Seconds later, I’m falling deeper into the rabbit hole of Facebook, engrossed in pictures of my friends’ children and personality quizzes that promise to explain my own psyche to me, and how-to videos for recipes I’ll never get around to trying. My husband or my daughter say something to me. Most likely, I don’t hear them the first time they say it, so they have to repeat themselves…at which point I only halfway pay attention because I was already in the middle of an article and I can’t focus on both at one time. Minutes later I ask one of them a question, realizing as I’m asking it that I should know the answer because they were just talking about that. I feel the familiar twinge in my stomach as I realize that once again, without even meaning to, I have chosen the triviality of social media over my family right in front of me. The truth is, I’m addicted to Facebook. I wonder sometimes if I ever should have gotten a smart phone to begin with, even though it has made my life so much easier and my ministry here online would be nearly impossible without it. I wonder if the convenience is really worth the price I am paying…not to my service provider, but to my life. Because what I’m realizing is that I suffer from a chronic case of FOMO – the fear of missing out. It’s been a lifelong struggle for me. I remember going to parties I didn’t want to go to as a teenager, mostly because I knew everyone would be talking about it and I didn’t want be the only one who didn’t go. I’ve always needed more sleep than other people, but would keep myself awake at slumber parties because I knew the fun wouldn’t stop just because I went to sleep. I struggled with my decision to attend a private liberal arts college instead of the state university my high school friends were all attending, and even today will feel an adolescent sense of rejection when I realize my college friends have been spending time together without me. I’ve seen a lot about FOMO lately (on social media, ironically), and it seems that I’m not the only one who has a debilitating dread of missing something: a picture, an announcement, an article, an event, a hilarious meme that everyone will be talking about. 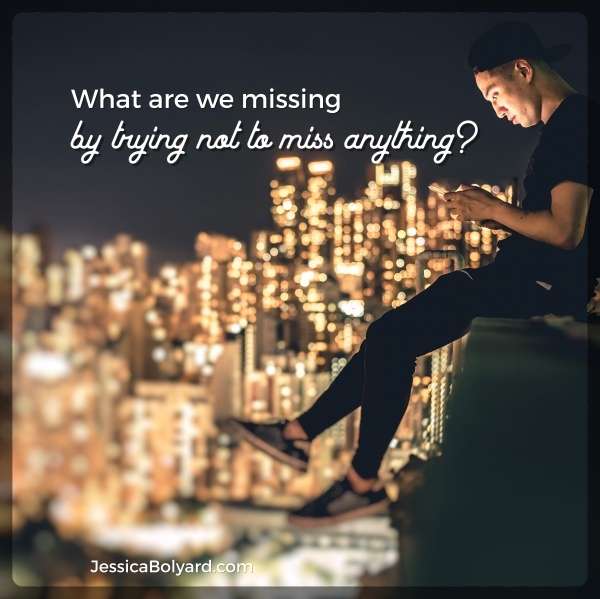 We are obsessed, and that obsession with being informed has fueled an irrational fear of missing something. Being connected and staying informed are important, but only to a point. 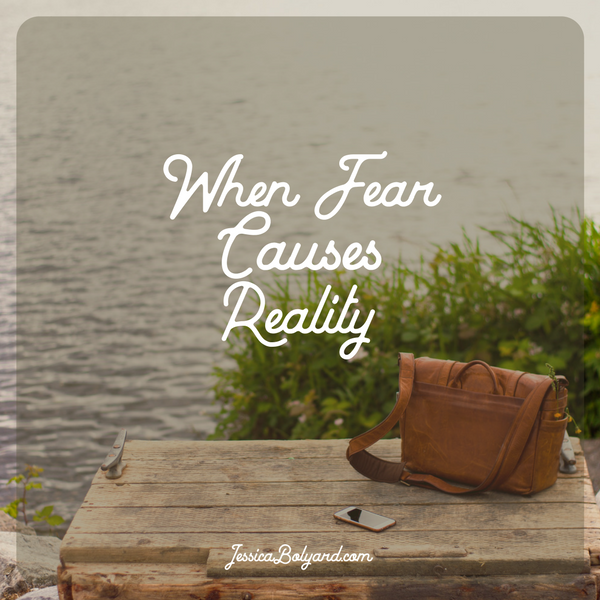 It becomes dangerous when our fear of missing out causes us to miss out on our lives. It’s a paradox, really. 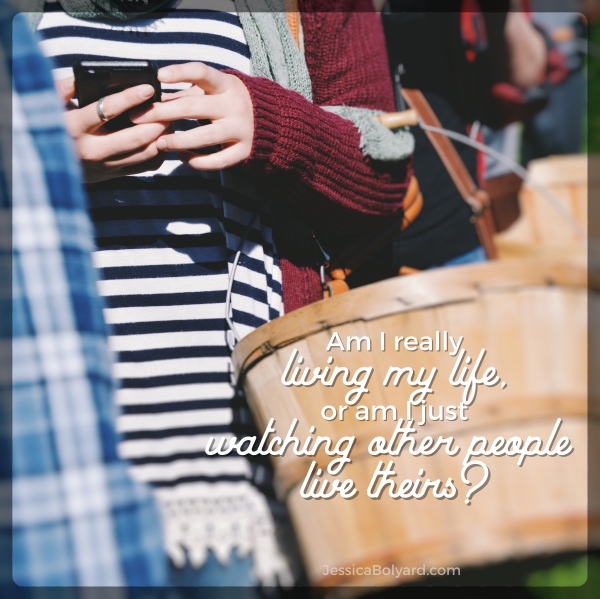 I – we – go to great lengths to ensure that we don’t miss out on details of other people’s lives, but in so doing, we’re missing out on our own lives and don’t even realize it. I know where my friends went to dinner…whose baby started walking today…the latest ridiculous news item about a political candidate. I can describe silly videos of baby goats in pajamas and dogs who appear to be talking and hundreds of funny videos of cats doing ridiculous things. I can fill in conversations with anecdotes from a meme or cartoon someone posted earlier, and know things some people don’t about the happenings in the world today. I find myself wondering, though, what it will feel like in five….ten….twenty years when I realize how much time I spent staring at a four-inch screen in my hand while my life passed me by. My anxiety doesn’t usually let me dwell on thoughts like that, because it’s hard to think about and it only makes me feel stressed. But maybe I need to let myself feel anxious about the passage of time and my involvement in it. 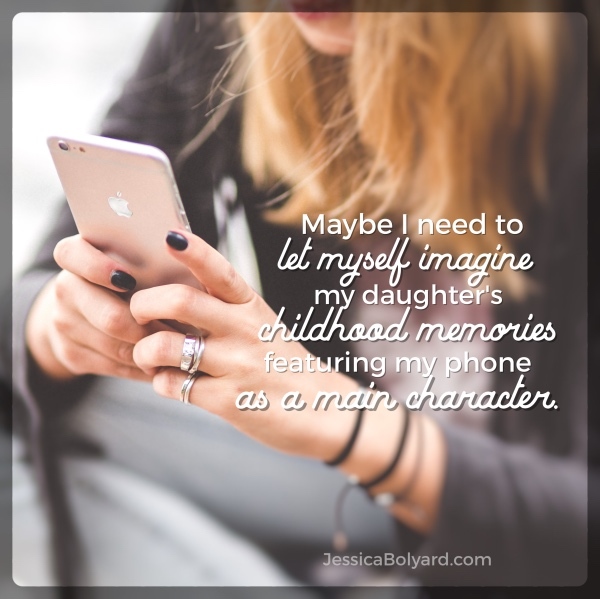 Maybe I need to let myself imagine my daughter’s memories of her childhood featuring my phone as a leading character. I was created by God to live a life of my own – not just to watch others live theirs. I was created to be me – a unique person with unique gifts and things to contribute to the world – not just to press “share” on what other people are giving to the world. I was created to be a wife – not just to read the articles on marriage that other people post while neglecting my flesh-and-blood husband on the couch next to me. I was created to be a mom to my little girl right now – not just to post pictures of her so I can remember this moment later. The thing is, there is nothing inherently wrong with social media. It is a good thing to be connected. It is a good thing to know what is going on in the world. It is a good thing to be in community and to live life alongside other people and to offer support and encouragement for all of life’s ups and downs. Like all good things, though, our enemy has a way of taking what is good and twisting it into something destructive. An innovative tool for social connection is instead building an antisocial culture. It’s something I wrestle with a lot, but sometimes I refuse to wrestle with it or even recognize it’s an issue. We all do it, right? Because changing anything about it would just be too hard. But the bottom line is that all of this is just a phase – this moment, this day, and this life. I just don’t want to miss it. Deep down, that’s what I’m really afraid of. I’m glad you explained what FOMO is. I’ve seen it used to much lately. You are so right in that we are becoming a society where we are not sociable. I find myself in situations where I TRY to talk to someone only to find that they aren’t really paying attention. For someone like myself, it creates more angst and anxiety because now I think that I’m just not an interesting person, that what I’ve done isn’t interesting and its importance fades into the shadows. I love those times when I can’t connect with those apps I have on my phone. I didn’t miss the connection at all while I was in the valleys of West Virginia. I actually got to know the folks I was with because that was our only connection ~ communicating face to face. Thanks, Jessica. I have noticed since going on a social media detox my FOMO is almost non-existence. It’s funny how when we remove stuff from our life & realize how little it added to it [life]. I hear what you’re saying. I’ve been spending less time on social media and can honestly say I don’t miss it. I don’t think I suffer from FOMO, but maybe it’s because I look at it a different way…What I don’t see or hear about can’t hurt me. If I don’t see someone’s vacation pictures, I don’t think about my lack of vacation. If I don’t follow a conference I can’t go to, I don’t spend the weekend wishing I was there. You get the idea. (All learned from experience.) And yes, I agree…social media can really take us away from what’s right in front of us.